How do electric bicycles work? How do you determine e-Bike performance? The Motor - Speed or Torque? The Battery - Voltage & Capacity? The Controller - Bringing the throttle, motor and battery together... in harmony. E-Bike EMS - Electrical Management System - Don't FRY your components! What are your local e-Bike Laws? Electric bikes, often referred to as electric-assist or e-bikes, are a traditional bicycle frame (with operable pedals) and an electric motor drive system. The electric motor drive is usually in the form of a hub motor, mid-drive motor, or belt drive connected to the rear wheel. They allow the rider to either pedal the bike or leverage the power of a battery and motor drive system. To use an electric bike, you just charge the battery, turn the controller system on, and then push the thumb throttle to initiate the motor drive system. 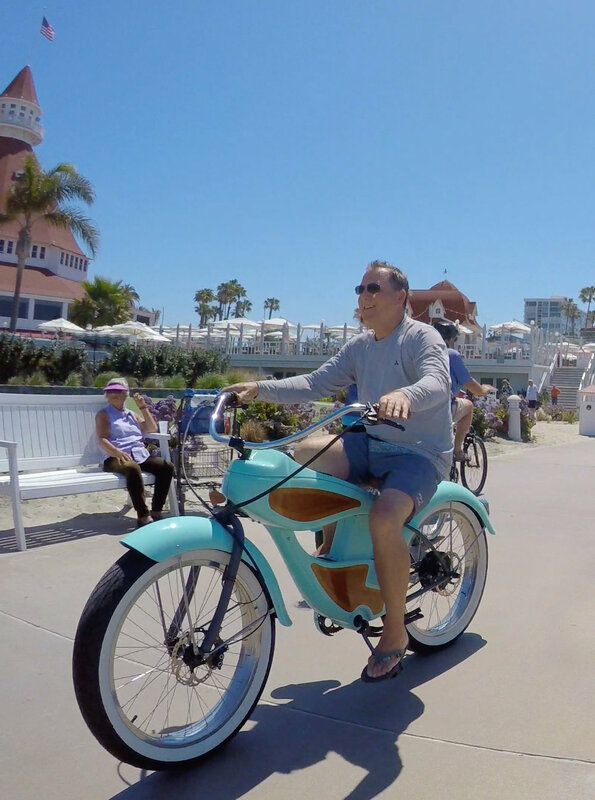 You also have the option of pedaling freely, and if desired you can use the electric drive to gently supplement power up hills, or just to go fast from point A to B. Using the throttle only, the bike behaves much like a traditional gas powered scooter because the rider doesn't have to pedal. an e-bike provides fantastic benefits. The benefits of electric bikes are fantastic, and often go unrealized by electric car (golf cart), motorcycle, and scooter owners. Often no driver's license, registration or insurance is required to ride. Can be used on road shoulders, sidewalks, boardwalks, bike paths or anywhere off-road. Easily move through congested traffic areas. Efficient and affordable parking options, fits in any normal bike rack, or to a pole/railing. Safer than street-legal scooters or motorcycles because they operate at slower speeds. Lighter, quieter, cleaner and more reliable than gas powered vehicles. Less expensive to operate than gas powered vehicles. Provides an opportunity to exercise and practice balance. Social opportunity to get in touch with your community and become more social. Can't be used on interstate highways or other high-speed roadways. Some State's laws may require license/registration, power limitation, and certain equipment to be legal on roadways. More expensive than a traditional bicycle, and more complex. Slower than a full powered car, moped or motorcycle. Electric bicycles are quite simply a blast to ride. They're also easy to operate. Turn the drive system on, push the thumb throttle a little, and smoothly and progressively the electric hub motor spins the bike wheel. Once your moving, its like a blast of wind in your back, pushing you down the road. Mash it down, and power surges from the battery pack, through the controller's massive transistor gateways (MOSfet's), and on to the motor screaming up to full speed! Whether you choose to purchase a production e-bike, or build your e-bike from a DIY kit, its important to understand what your buying. The market is flooded with mass-produced electric bicycles, and they are not all made the same. The low price point is attractive, but think of it as the manufacturer who sells the smallest battery and least powerful motor. Great on level ground, but hit a small hill and you realize why they left the pedals on the bike. The information covered in this section is intended to educate, empowering you to make a best 'buying decision' based on your specific needs. It also provides fundamental 'need to know' information for e-bike owners. Electric bicycles are more complex than a traditional bicycle, so understanding how it works is helpful. The amount of power, torque, and speed capable from an e-bike is dependent on the performance of its electrical components. The limitation of e-bike performance is almost always dictated by the 'weakest performing' component used to build it. These components work together as a team. If you decide later that you want more torque or speed, you will more than likely need to replace ALL three components to achieve that goal. Let's take a look at each of these components individually, and how each one fits into the equation. The battery is the source of power for the e-bike. If you were to connect the battery directly to the motor, it would spin 'out of control' at full throttle. To keep that from happening, the battery power flows through a controller. The controller acts as a gatekeeper between the battery and motor. The more you operate the throttle, the more the gate opens feeding more power to the motor. Almost all commercially available e-bikes are not very fast or powerful to start with. Manufacturers typically pick the cheapest essential components they can to achieve a 20mph top speed (without pedaling) on level ground. You may be able to increase the size of of the battery pack (extending range), but no extra speed or power would be possible. Simply put, the more power (watts/amps) you run to your motor, the more speed and torque you get. Of course, you are limited by gearing on how fast the bike will go, and each motor has its own gearing or winding. Depending on how a motor is wound (when manufactured), it will deliver either 'high torque' or 'high speed'. If your bike's motor winds out at top RPM and your e-bike is going only 20 mph, it won't go much faster even if you push more power to it. What you will get is torque. Torque is what powers the bike up hills or pushes it through sand. So when considering a motor, you have to ask yourself... Do you want speed or torque? My personal advice - torque is the better choice for a cruiser for a couple of reasons. Safety: It is easy to fit an electric motor that will drive bike speeds to that of a scooter or motorcycle (+40mph). But it can be dangerous. One, the bicycle's braking system is designed for less than 20mph. They are cable operated, not hydraulic operated and offer very limited 'emergency' stopping capability. Two, if you've ever hit a pot-hole at 35mph, you know it's a jolt. Try it once on a rigid bicycle frame with 'zero' suspension and you'll never quite be the same. Once your 'comfort cruiser seat' horn smashes your delicates into small pieces, you are immediately catapulted into the air whereby the bike and its rider are usually separated (still at bike speed). Versatility: Torque is what powers you up a hill, or pushes fat tires through the sand. Going off-road with a cruiser is what its all about. Without that low-end grunt feel of raw electrical power between your legs, you may feel a little neutered (but you'll still look good). 20-25mph is really fine as a 'max' speed. In fact, most riders find 8-12mph the most satisfying. As a builder, I don't think any bike should go faster under power than you could pedal it yourself on level ground. After all, it's a bike. If you want to go fast, let's build something starting with a more appropriate platform. The battery pack is by far the most expensive component. The battery is where all the power comes from, and in an 'electric vehicle', its everything. There are a few important things to consider when selecting a battery pack. Voltage: The higher the voltage (24v, 36v, 48v, etc. ), the more power you can transfer to the motor. Capacity: The more amp hours (Ah) you purchase, the more cruising range you get. It's your fuel tank. Power: The ability of the battery to transfer its energy (in Amps) efficiently. The more power transferred, the more heat is generated (which can reduce cell life expectancy and easily burn-up a battery pack). An e-Bike battery pack is actually made up of a bunch of small batteries (cells) tied together to create one big battery. The quality of these cells is extremely important. We've all seen videos of cheap li-ion batteries bursting into flames. Pretty scary! From what I've observed, those in the e-bike industry recognize Samsung brand cells as proven to be stable and effective at putting out high amperage while still retaining decent life expectancy. If you take away anything from this section, take away this. Performance battery packs made with high quality fused li-ion cells are expensive, often costing more than some e-bikes all together. Lower quality cheaply-made li-ion batteries have an attractive price point, but be mindful that you may be storing that e-bike in your home garage. Cruising range is directly proportional to battery size, meaning only that the bigger the battery, the more power you can store. But that doesn't really tell you how far you can go on a single charge. The truth is, there are too many variables that factor into cruising range. Is it flat roads or hills? Are you going fast or slow? Are you on pavement or sand? I like to think of the battery like a jet-pack and I've only got so much rocket fuel to work with. In this case, 15 amp hours. Think of Ah's as simple units of power. You can mash the throttle and burn the them all up in 15 miles, or you can miserly dole out power units and stretch your distance to 35 miles. The e-bike computer display provides all this power data in real-time. You can see exactly how much you've used, how much you have left, and how much your using at that exact moment. What it doesn't say is how much further you can travel? That's because it doesn't know if you plan on mashing the throttle all the way home. Its all about how well you manage your energy. The controller makes sure everything runs smoothly. Your thumb throttle, hub motor, and battery pack all connect to your controller. It's the gatekeeper between battery and motor through which 'no electricity shall pass' unless you operate that little thumb throttle. Push it a little, and smoothly and progressively the electric hub motor spins (bike wheel). Mash it down, and power surges from the little batteries, through the controller's massive transistor gateways (MOSfet's), and on to the motor screaming up to full speed! All the while heating the battery pack, controller and motor to its limits. It's impressive to be sure, but unchecked it can go beyond those heat limits, easily frying your equipment. The most important take-away here is to ensure the controller's voltage matches that of your battery pack. The more amps (heat) a controller is able to transfer, the more beefy its components are, and the more expensive it becomes. A high-quality controller can actually make your electric motor run quieter, smoother and more efficiently. By comparison, the controller cost ($) is a fraction of the more expensive battery pack & motor cost ($$$$$), but it's usually the battery and/or motor that fries first. Since the industry began many years back, there have been significant improvements in technology for e-bike drive systems. An on-board 'electrical management system' (EMS') is a small computer that provides you with precise and critical information about how your e-bike system is operating. It also enables the user to set programmable limits on e-bike performance, such as max power output & max speed. Some higher-end systems can also protect your drive system from overheating. Temperature sensors remotely mounted in the motor housing can allow the EMS to reduce power to the motor automatically, before any damage is done. The heart of the EMS is the informational display. It can provide important data about electrics in real time. It can also provide some powerful management tools. And while the EMS might set you back a couple hundred bucks, many e-bike manufacturers choose not to include this highly recommended equipment because it is not essential for basic operation. You may get an LCD display for battery status, but don't assume it has any programmable capability or automated over-heat protection built-in. There is a difference. Our advice, protect your motor and battery pack from damage. They're expensive to replace. Before buying an e-Bike, its REALLY important to understand that many manufacturers have found the best way to get to the 'lowest price point', is by providing a cheaper, less powerful battery coupled to a weak motor. Some e-bikes may only deliver a few miles of riding before the battery is exhausted. And then there are the 'power-sucking' hills and grades. A 600w e-bike will just not have the same performance as a 1080w e-bike. Don't be surprised if the 'low price point' bikes strain to make it up long rising grades, needing some supplemental pedal input. The weakest link on some of the lower end e-Bikes is the motor hub. When pushed up long steep hills, or through the sand, they can overheat easily and burn-up. Most high-quality or custom-built e-Bikes actually provide an on-board 'electrical management system' (EMS) that protects your drive system from overheating. Disclaimer: This information was not written by a lawyer, and in no way constitutes legal advice. This information is intended only as guidance on how to look up information that will allow an individual to understand their local laws pertaining to operation of electric bikes. In the USA, it can get very confusing to understand 'what is legal' and 'what is not' with regard to an electric bicycle. Part of the confusion is caused by the Federal Law, which has often been quoted by people selling electric bikes. To begin with, this Federal definition applies only to importing and selling e-bikes. As a retailer, it matters to your insurance company whether you are selling a 'bike', a 'motorcycle', or some vaguely defined toy. For what its worth, if you are selling an e-bike, the consumer product safety act HR727 defines an e-bike as.. This is great information, but it really has nothing whatsoever to do with the law that applies if you ride your e-bike on the street in your local neighborhood. To find out if you can ride your bike on a public roadway, you have to look up your own State motor vehicle statutes. Yes, even though your State may not call your e-bike a motor vehicle, it will still need to comply with and obey traffic laws. Regular bicycles have to obey traffic laws, as do people on horses, or even pedestrians. Your local State may have very definite rules as to what is an e-bike, what is a moped, and what is a motorcycle. You may need a driver's license to ride an e-bike, or maybe not, depending on the exact wording of your local State motor vehicle statutes. You might want to perform an internet search regarding the e-bike (or moped) laws in your specific State. Your best approach is to go directly to your State's motor vehicle department website, and get a copy of the local State vehicle codes. Various laws that apply to your e-bike may be scattered in different sections of the code. Start with definitions, and look for definitions of various vehicles; Bicycle, Scooter MoPed, Motorcycle, Bicycle w/Helper-Motor, Electric-Assist Bicycle, Motor-Driven Cycle, etc. Look for what best describes your e-bike.